Big baby: Players are signed to big-league contracts at a young age in Latin American countries. David "Big Papi" Ortiz was no different. At age 5, when scouts and sports announcers called him "Big Baby," Ortiz was a star on the Santo Domingo Ninos in the Dominican Republic. He could hit a foam ball nearly 7 feet and was adept at chewing the stitches off baseballs. But it was his physique that most impressed scouts. 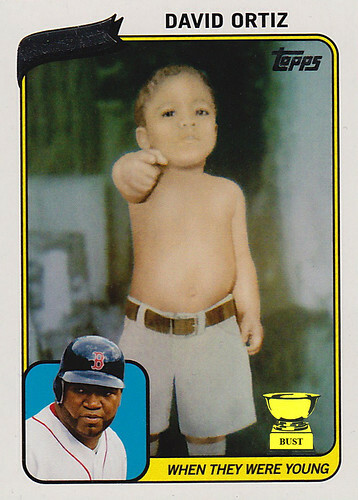 Big Baby already had Big Papi's patented barrel-boiler gut, and his sausage fingers seemed made for gripping a bat. He had attitude, too, as can be seen in the card above, in which he's pointing at the Topps photographer and saying, in Spanish, "I go poo-poo on your camera." His style was legendary even at age 5, when he played in tube socks pulled to his knees, cholo shorts, shirtless, with a diaper fashioned into a jockstrap. His beard would grow a few months later.